Yesterday evening was pretty slow, so I talked for a while with one of the library regulars, who is 12 years old. She started making one of those folded fortune teller things that kids make (which, as everyone knows, are completely and totally accurate). Her: "Okay, name a good fortune." Me: "Um. Being happy in life?" Her (making a face): "No." Her: "Nah. Kids can't play the lottery." Me: "Oh, okay, this is for kids. Winning lots of...candy?" Her: "Okay, okay. Name some BAD fortunes." Her: "RITA. Give me something that kids actually DO these days." Me: "Why don't you just tell ME what a bad fortune would be for kids?" Me: "How about losing your library card?" Me: "What! I would be sad if I lost my library card." Her: "No. That's not THAT bad. Okay, I'm putting 'bad luck for the rest of your life.' It means that you get lots of money and then lose it in the same day." Me: "Sounds like lots of adults I know." Her: "Okay, here's your fortune: YOU WILL BE RICH." Her: "It probably won't come true...but it gives people hope!" Me: "Hope is a good thing." We tried the fortune teller again. This time, I was not so lucky. Her: "You don't want to know." Her: "YOU WILL FAIL IN LIFE." My attempt at making a fortune teller. 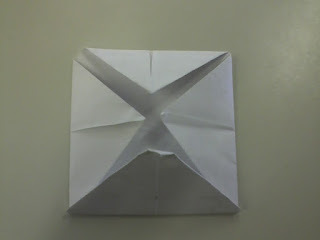 It's safe to say that "origami expert" is not in my future. Her: "What do you think is the perfect life?" Me: "I don't know. I think just being happy is a good start. What do YOU think is the perfect life?" Her: "To have everything the way I want it. If I want people there, they will be there. If I don't want them there, they won't be there." Me: "Well, you can sorta make that happen that when you're older." Her (after thinking): "Actually, I just want magic."